Yes, Franz Alt's powerful little book is in German. And yes there's perhaps only 100 million native German speakers in the world. But that's no excuse for ignoring this book. With rudimentary German you can get the gist of his message and most English speakers know rudimentary German whether they realize it or not. I first came across Franz Alt when I reviewed Windiger Protest. He was one of the co-authors along with the other big names in German renewable energy: Jürgen Claus, and Hermann Scheer. 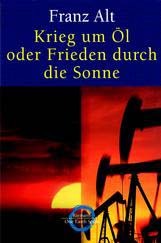 But it wasn't until I was riding a bus across the German frontier with a group of wind energy activists on our way to Denmark that I learned about this book and his other on a similar theme, Der ökologische Jesus. My interlocutors were two spritely Austrian grandmothers. Rosemarie Dietz and Helga Morocutti were active members of the Viennese interest group for electric vehicles (Arbeitskreis Nachhaltige Mobilitat Electrofahrzeuge). They had driven from Vienna to northwest Denmark in their electric car. Yep, and they were proud of it too. All the way across the "old" Europe in an electric Ford. They were discussing the book with others on the bus and I listened in. Ordering German books in North America is a simple as logging onto amazone.de so I ordered both books and in a few weeks they were on my doorstep. Alt's theme is clear from the title. There's chapters on 9/11, Iraq, climate change, and the need to turn to the sun to bring peace and abundance to all, and what Alt calls his Jesus-Buddha strategy. But Alt builds his case on a solid foundation of statistics. Alt notes that there are 28 million households in Germany and thus there's the potential for 28 million small power plants owned and operated by the residents themselves. Though Alt doesn't carry it further, consider that for a moment. If each household only produced 1,000 kWh/year, households in Germany could generate 28 TWh/year or 5% of German electricity supply. That's just to get you thinking about the potential. In Krieg um Öl Alt, returns to themes from his earlier book about the success of the Strom Rebels of Schönau: The village that built their own solar utility. Alt makes a, literally, spirited defense of wind energy. He notes that "wind" in Greek is synonymous with "spirit" or in Christianity, the Holy Spirit. The wind is then, the breath of the gods, or at least god's spirit for monotheists. Wind, therefore, is life's energy itself. How could anyone be against god's own energy, Alt asks rhetorically. Interestingly, the Danish wind power movement grew out of a philosophy expounded by 19th century theologian NFS Grundtvig on the value of cooperation. Grundtvig argued that all human activities should be life affirming. Danish wind pioneers, culturally influenced by Grundtvig's teachings, called wind energy, "technology for life" in contrast to nuclear power that grew out of war and destruction. Alt too compares nuclear power to the work of the devil. Krieg um Öl often evokes a celebration of the emerald city that's within reach. He calls the offshore wind farms proposed for the coast of Germany "cathedrals in the sea". For Alt, German farmers can be the "oil sheiks of the future". For these reasons and many more, Krieg um Öl is a challenging and provocative read. Krieg um Öl oder Frieden durch die Sonne, by Franz Alt, paper, 345 pages, ISBN 3-442-15289-5, €8.95, 2004, Goldmann Verlag, Neumarkter Str. 28, D-81673 München, Germany, www.goldmann-verlag.de, +49 (0) 1805 99 05 05, kundenservicespam @ spamrandomhousespam . spamde.